This file includes the full text of 12 books: Anticipations,Certain Personal Matters, An Englishman Looks at the World, First and Last Things, God the Invisible King, In the Fourth Year, Mankind in the Making, A Modern Utopia, New Worlds for Old, Select Conversations with an Uncle, War and the Future, and What is Coming? 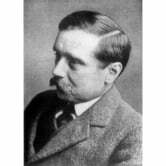 According to Wikipedia: "Herbert George Wells (21 September 1866 13 August 1946) was an English author, now best known for his work in the science fiction genre. He was also a prolific writer in many other genres, including contemporary novels, history, politics and social commentary, even writing text books. Together with Jules Verne, Wells has been referred to as "The Father of Science Fiction". Wells was an outspoken socialist and sympathetic to pacifist views, although he supported the First World War once it was under way, and his later works became increasingly political and didactic."